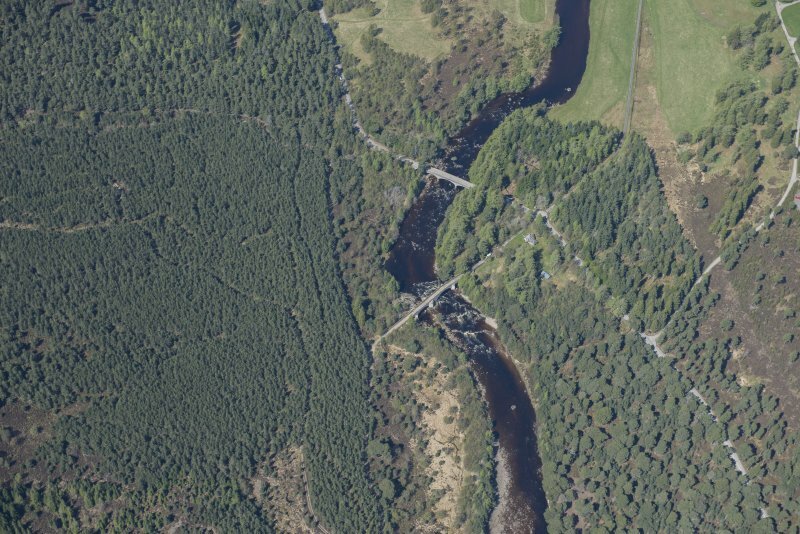 Oblique aerial view centred on the tollhouse and the road bridges, taken from the E.
Oblique aerial view centred on the tollhouse and the road bridges, taken from the WSW. 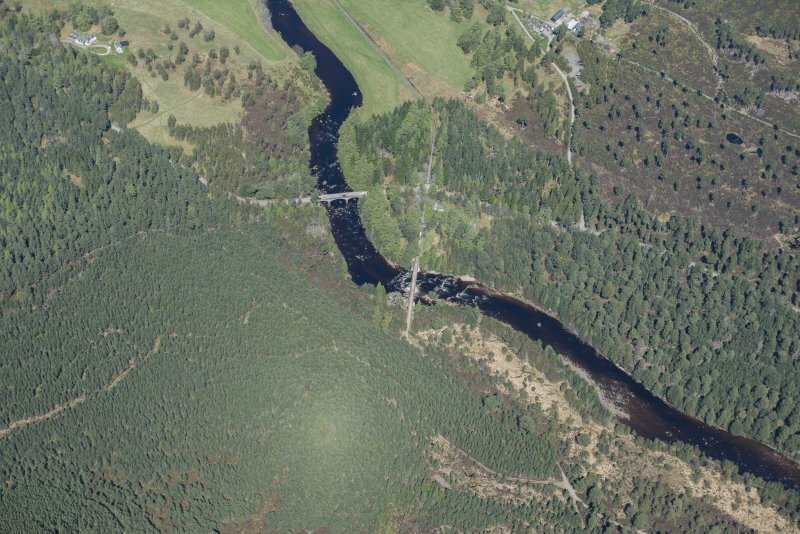 Oblique aerial view centred on the tollhouse and the road bridges, taken from the SW.
Oblique aerial view centred on the tollhouse and the road bridges, taken from the NW. 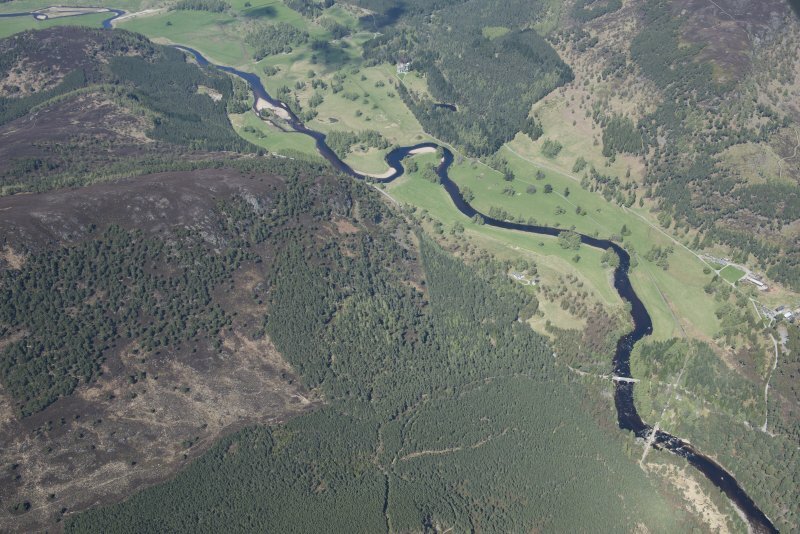 General oblique aerial view centred on the tollhouse and the road bridges, taken from the N.
Oblique aerial view centred on the tollhouse and the road bridges, taken from the SE. 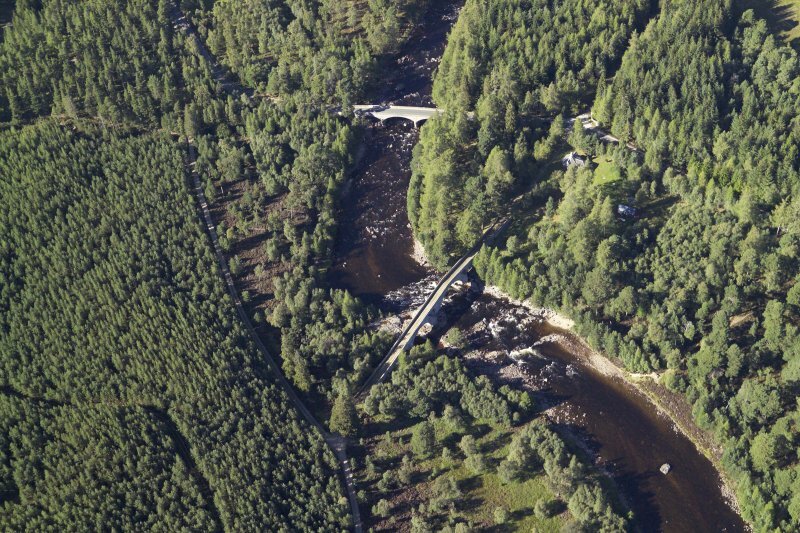 Oblique aerial view centred on the tollhouse and the road bridges, taken from the WNW. 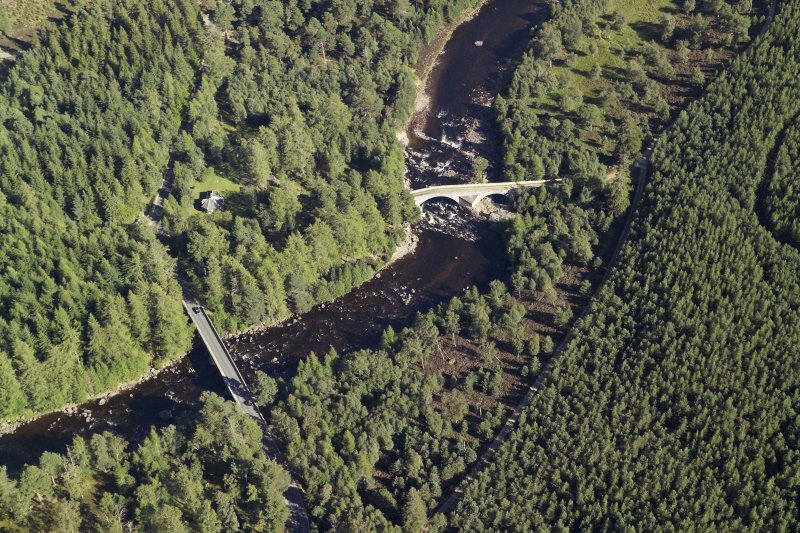 For successor and present (New) Invercauld Bridge, see NO19SE 7. 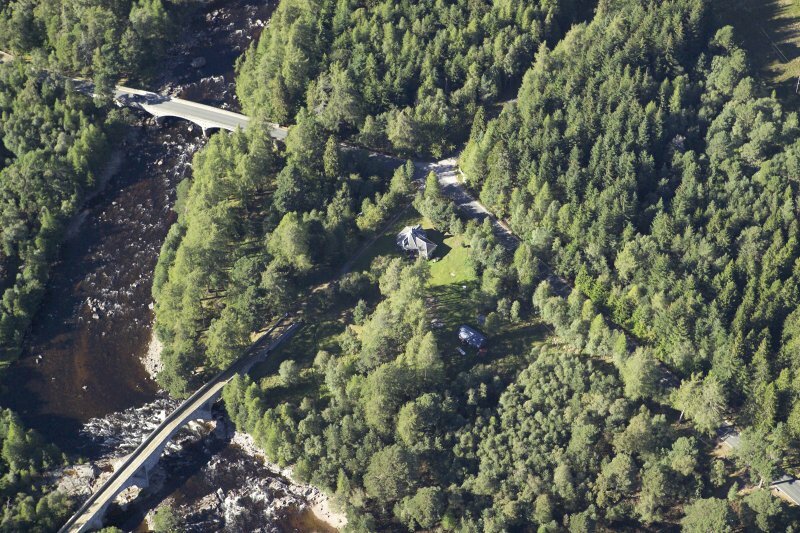 For tollhouse ('lodge') at N end of bridge, see NO19SE 10. 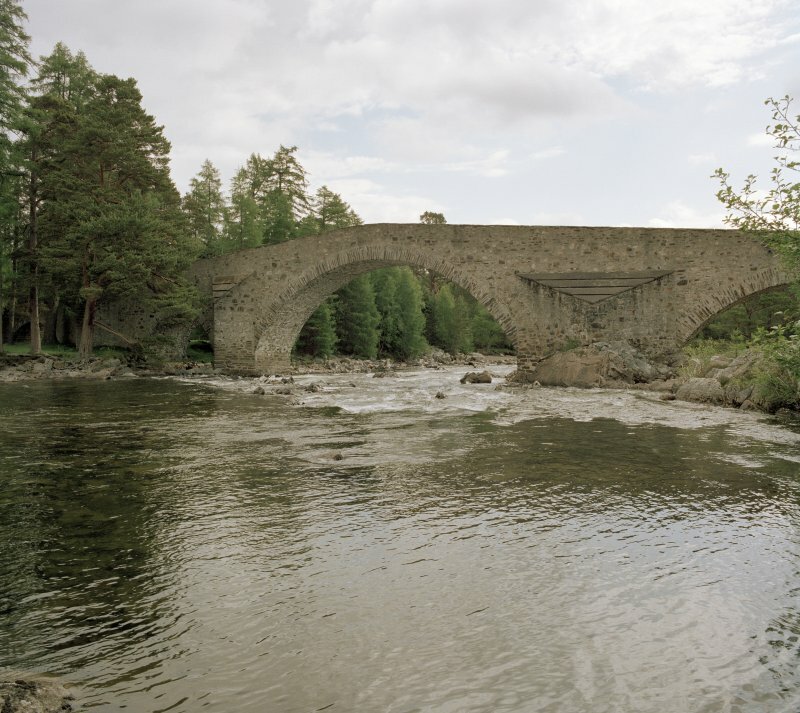 This bridge, on the line of the military road, was built c. 1752 and closed September 1859. (Location cited as NO 187 909). Built 1752 by engineer Major William Caulfield [Caulfeild]. 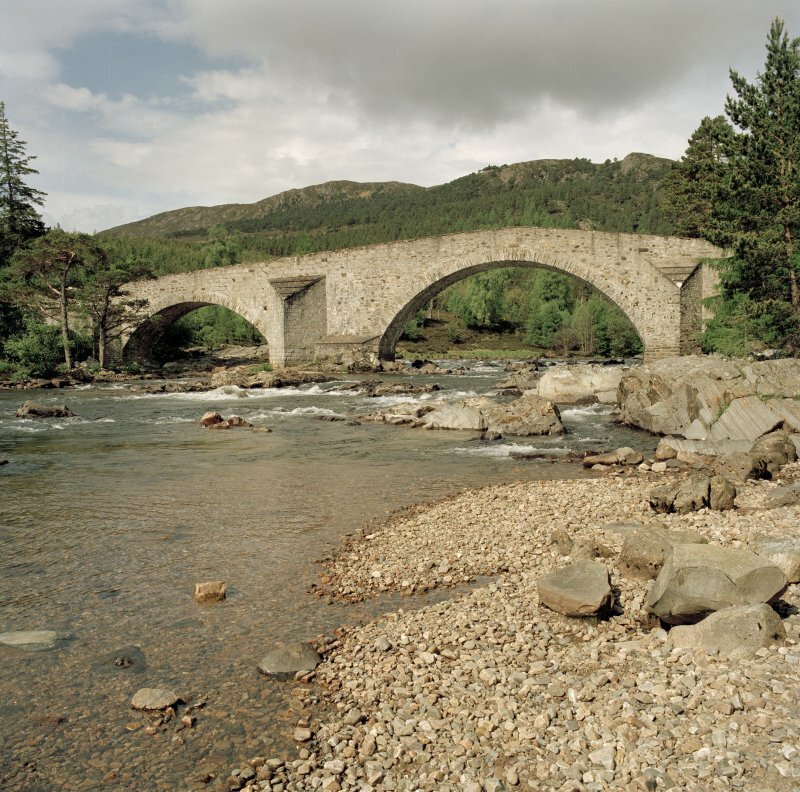 A remarkable 6-arch, hump-backed rubble bridge with segmental arches increasing in size to the centre. 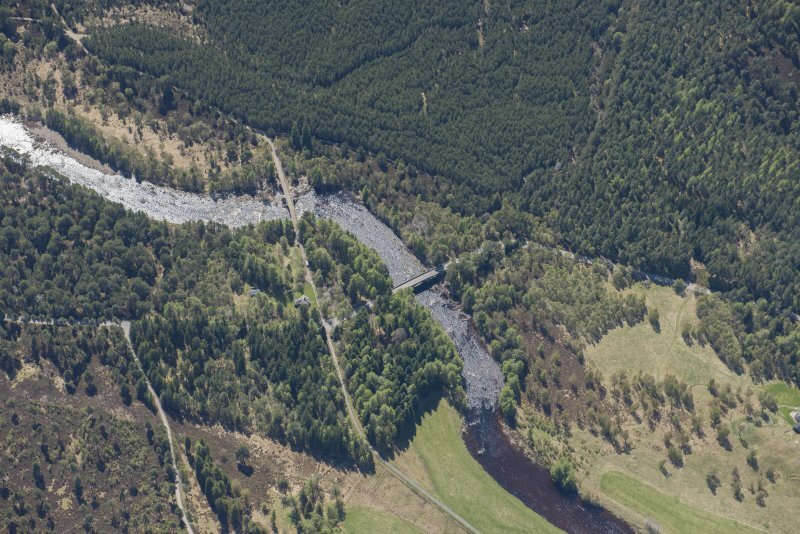 By-passed by the Invercauld Bridge (NO19SE 7) in 1859. (Location cited as NO 186 909). 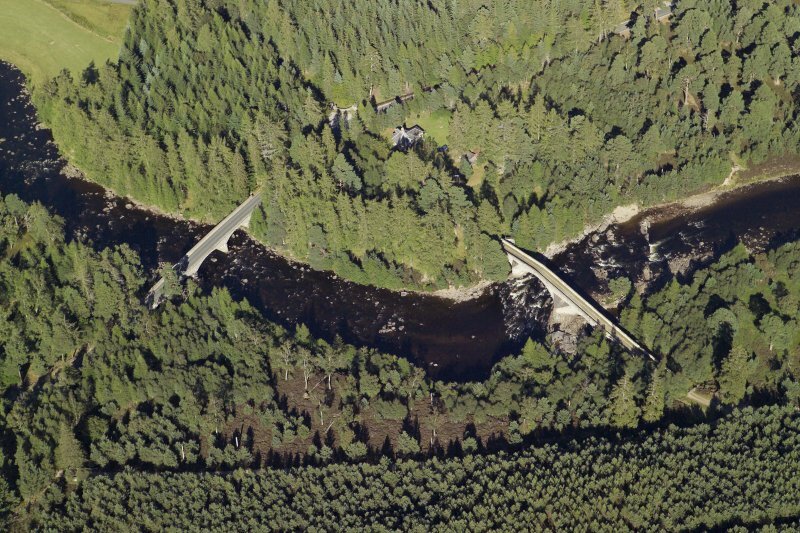 Old Invercauld Bridge: a six-span, hump-backed bridge of rubble, each span having a different size. 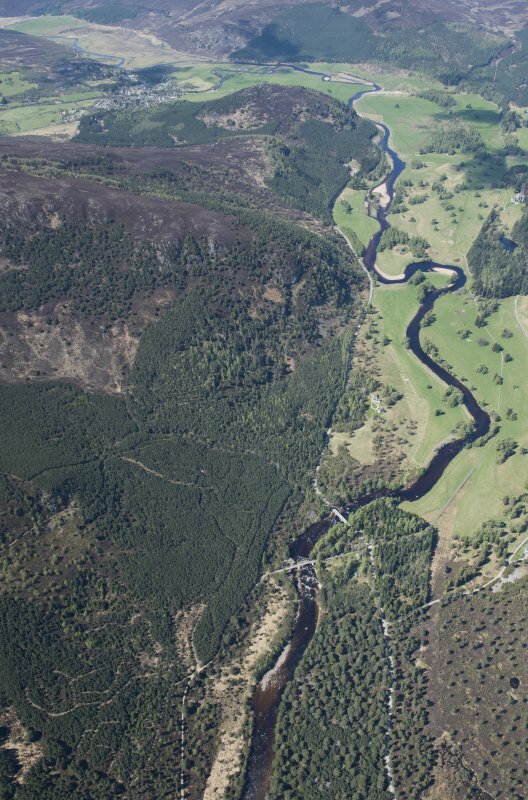 It stands on a rocky bend in the river, with reefs of rock across the flow; Caulfield [Caulfeild] had to do some blasting to prepare the site. 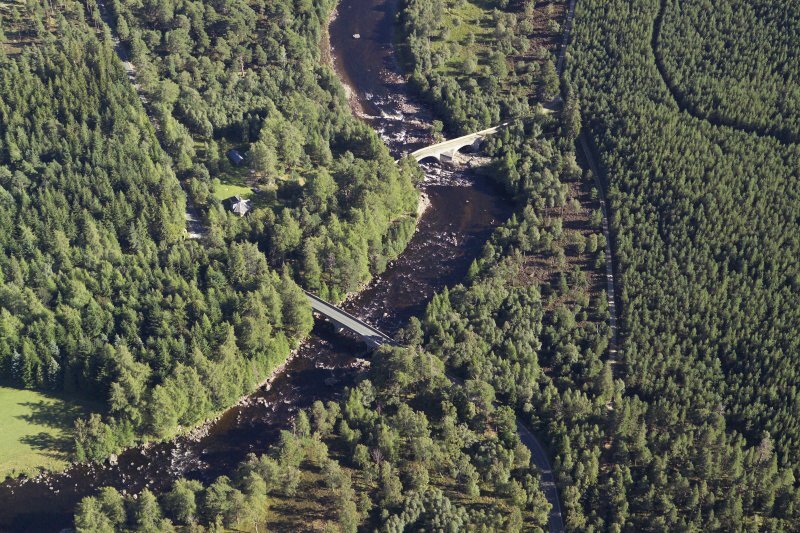 Looking at it from the downstream [SE] side, the largest span is the third from the right bank, under the highest point of the roadway, but the second is also a fair size. The fifth and sixth, which are hidden by trees and normally on completely dry land, are very small, the last measuring only 10ft [3.05m] across and 54ins [1.37m] high. 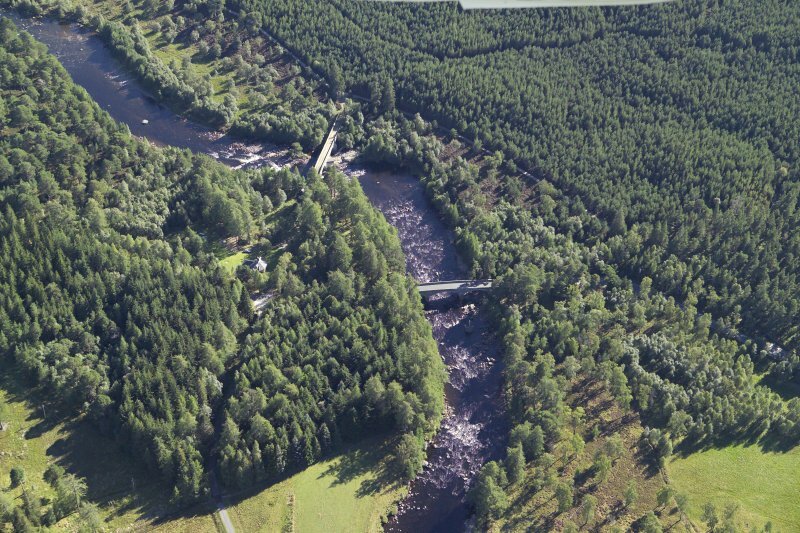 These two are effectively flood arches, whereas the first on the far bank is not.This asymmetry in no way detracts from the bridge's appearance. Rather, it enhances it, as do the unusual tall triangular cutwaters, which have roofs of large flags. The parapet is high at the hump, a good 50ins [1.27m] but it comes down to 23ins [0.58m] before the ends, which are splayed on the N side. 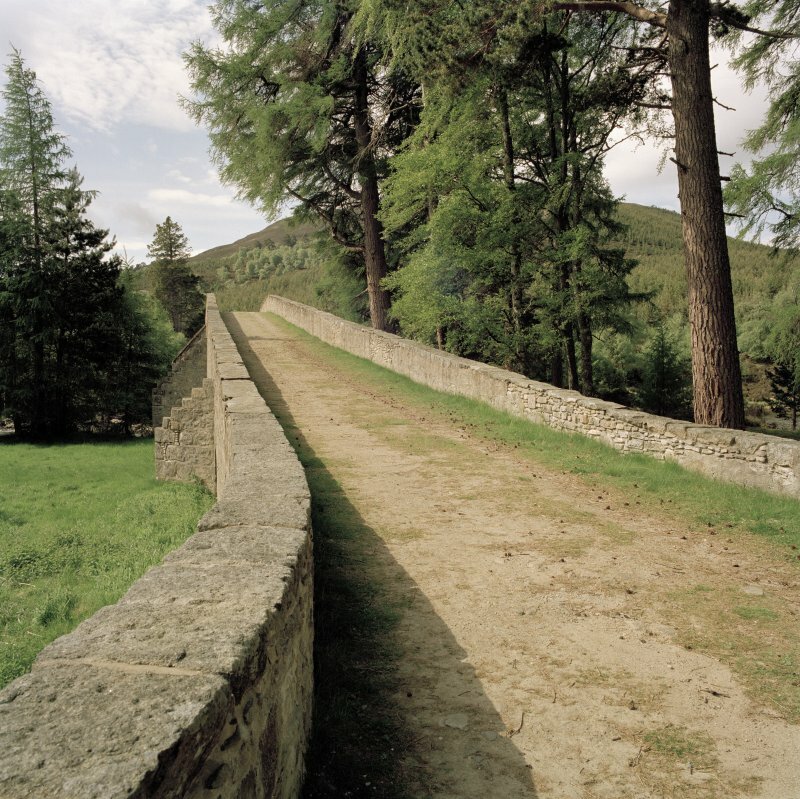 It is 17ins [0.43m] wide and topped with flat stones of different sizes. 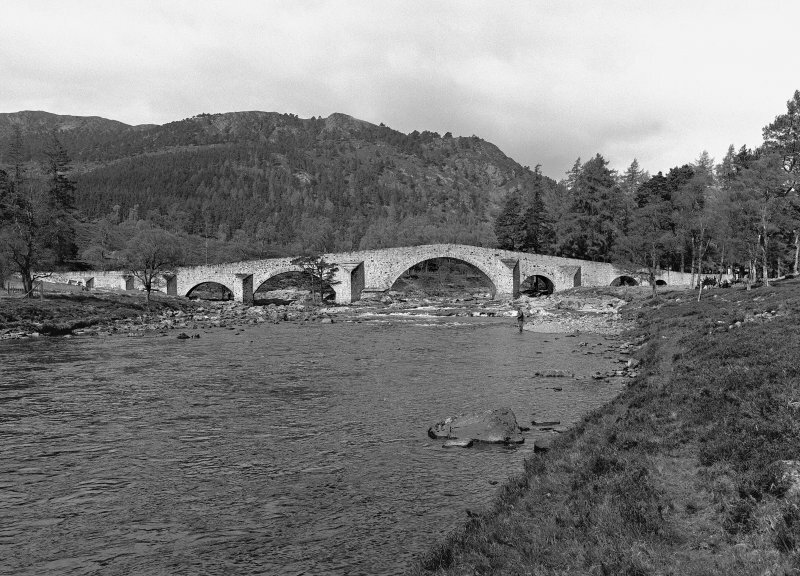 Old Invercauld Bridge, 1753, Major Caulfield [Caulfeild]. 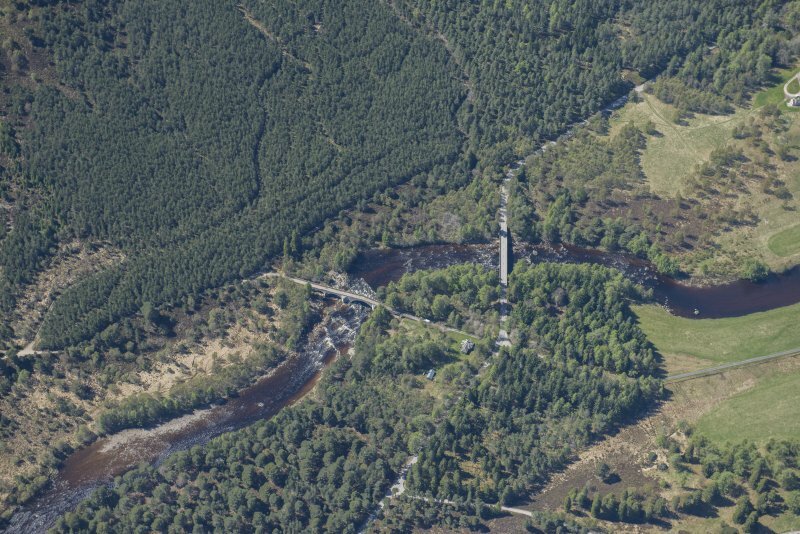 Military bridge to link Blairgowrie with Corgarff and Inverness. Humpbacked, high segmented arch, with lesser arches ay each side, and massive V-cutwaters. 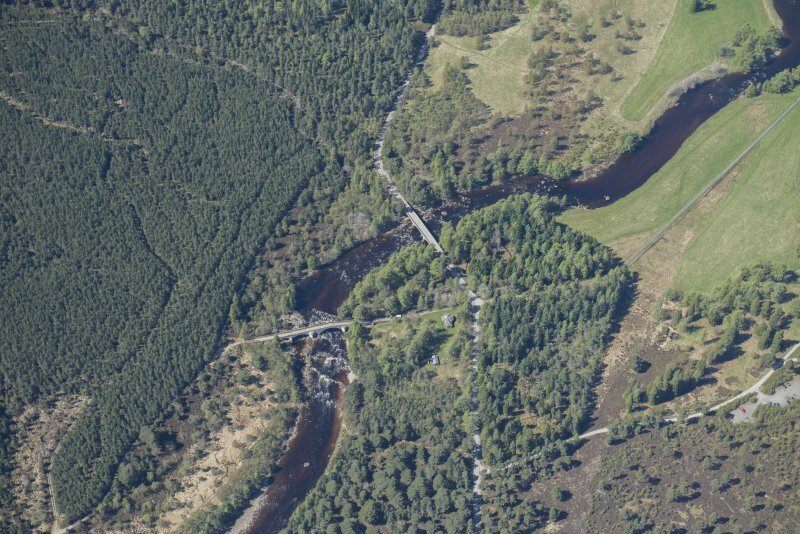 Superseded in 1859 by New Invercauld Bridge (NO19SE 7). 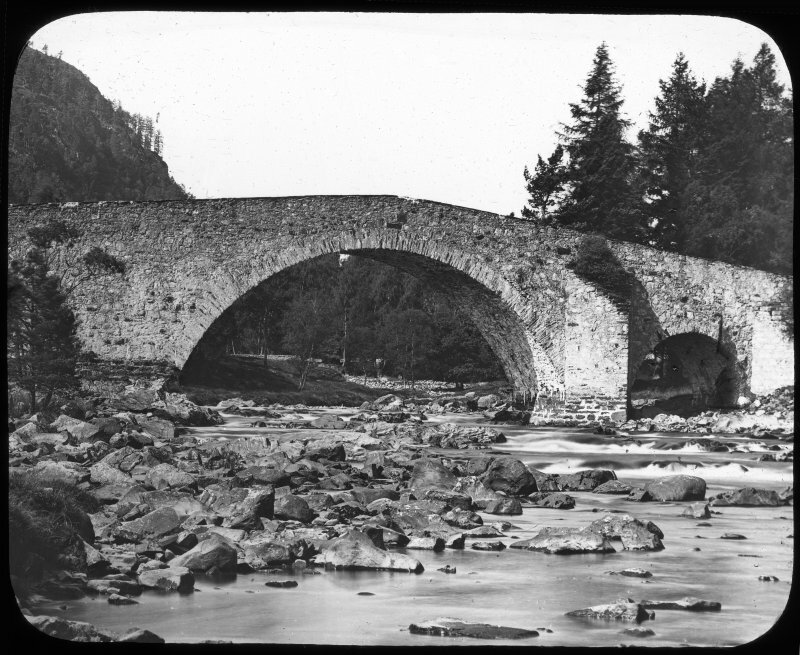 Rubble, hump-backed, high segmental arch bridge with lesser arches at each end. 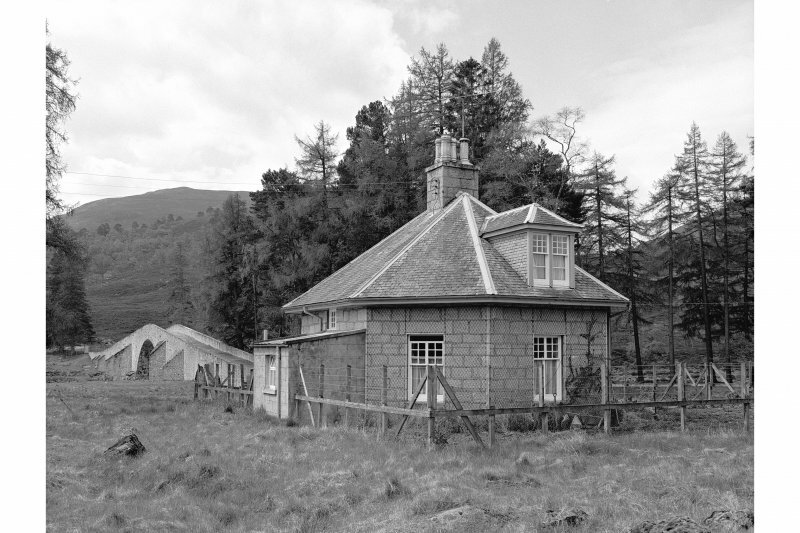 Designed by Major Caulfield [Caulfeild], engineer, 1753. 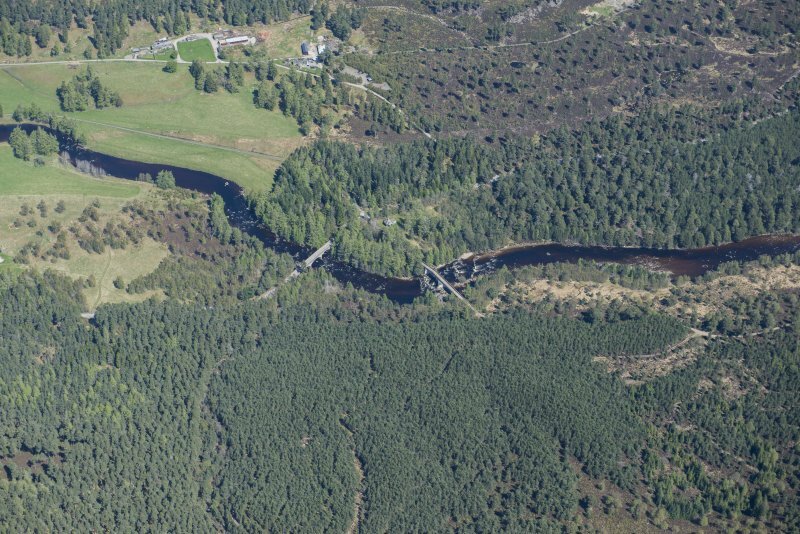 This bridge carries the former line of the A93 public road over the River Dee a short distance to the SE of the present Invercauld Bridge (NO19SE 7). For origin of this road as a military road, see MR 9. Information from RCAHMS (RJCM), 5 January 2006. NO 1862 9088 Work was carried out 12 December 2007 during the excavation of a new drain near the bridge’s S end. 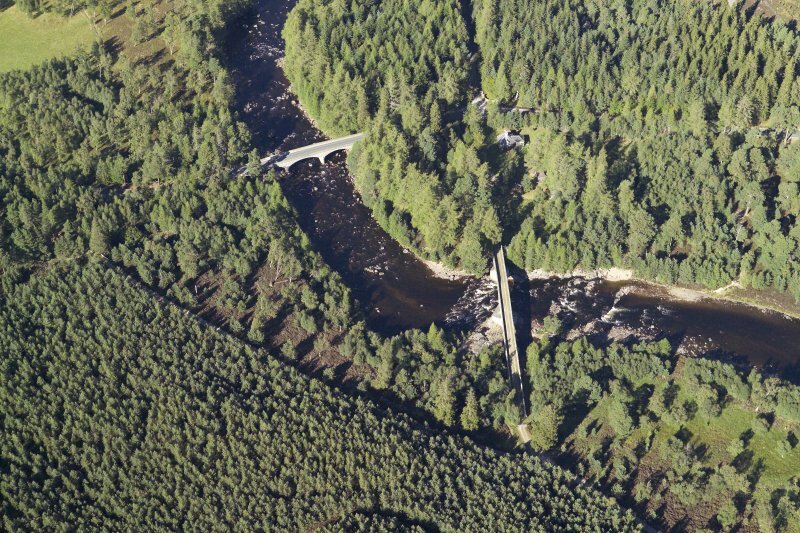 The excavation revealed two deposits of mortar and boulders at the E and W sides of the road aligned with the E and W walls of the bridge. 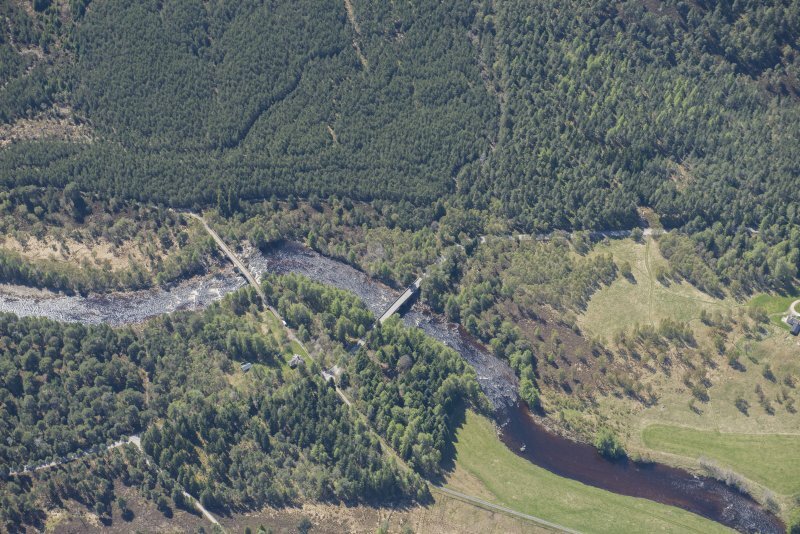 These may be crude banks built to keep the sandy/gravelly road deposits from washing away. A modern plastic drain was also recorded in the W end of the trench. 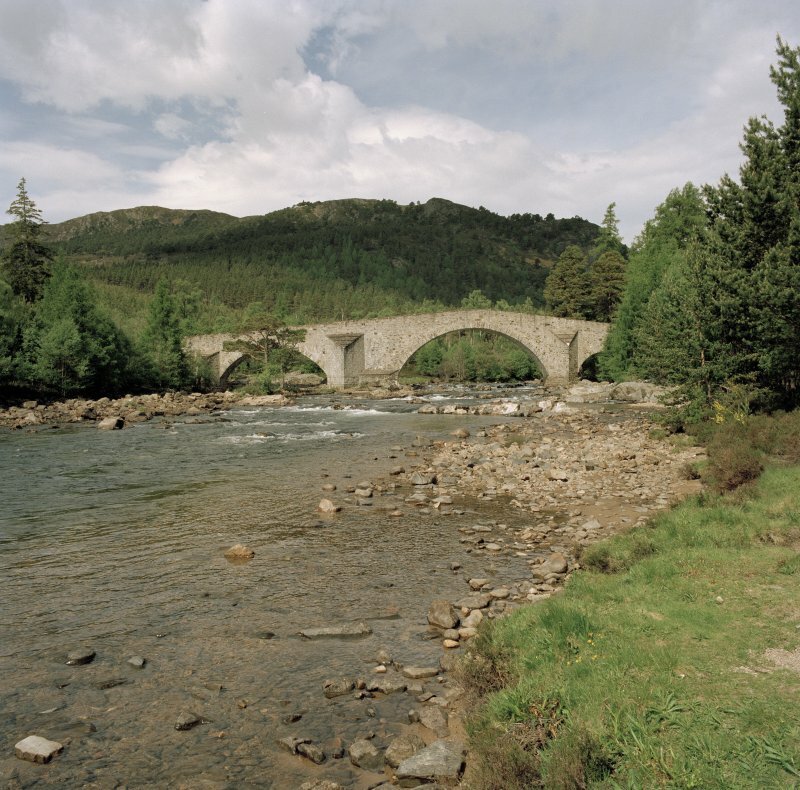 This historic and picturesque bridge, until bypassed in 1859 by the present bridge on the A93 road immediately north, formerly carried the military road from Blairgowrie to Fort George over the Dee at Invercauld. 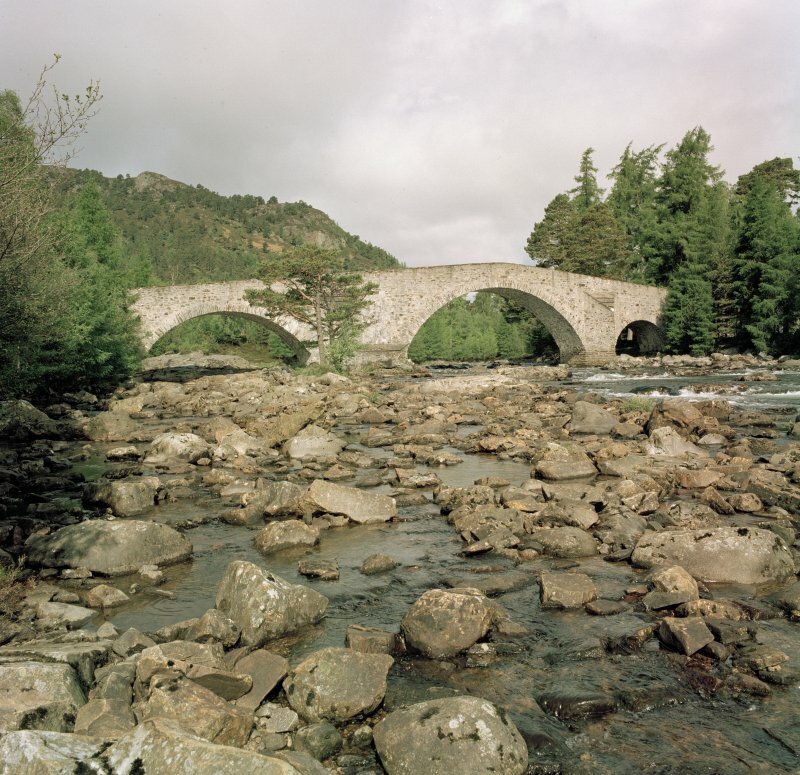 It was built in 1752–53 under the direction of Major W. Caulfeild who, as the successor to General Wade, was responsible for the construction of military roads and bridges in Scotland from 1743–67. 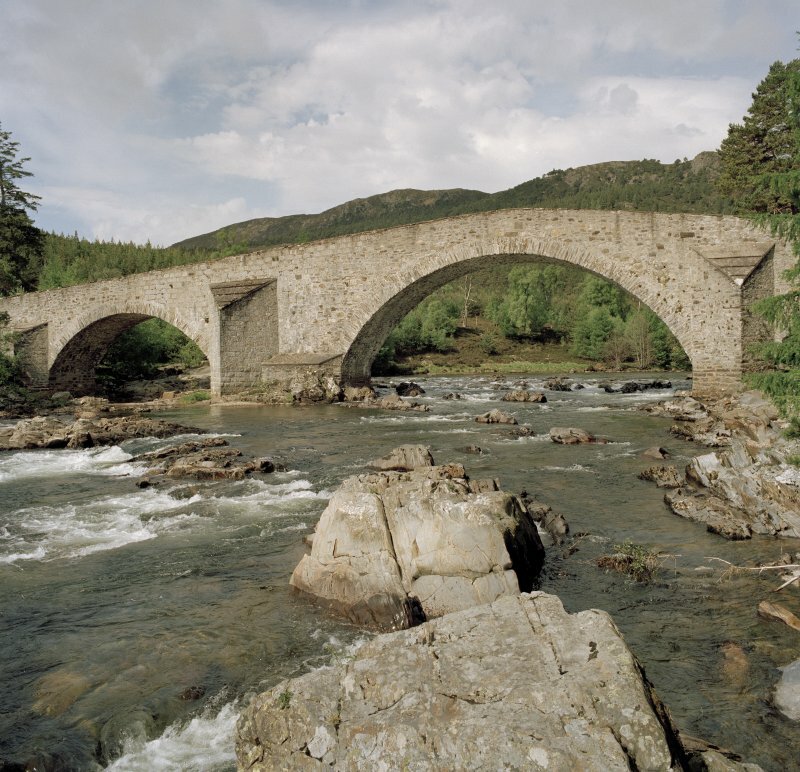 The bridge is asymmetrical with six arches varying from 10–68 ft in span and, characteristically for its genre, the roadway rises sharply from the low river banks to the crown of the main span, has arch-rings of narrow semidressed stones varying from 18–39 in. in length laid radially, and rubble masonry (granite) wing walls, buttresses and spandrels. 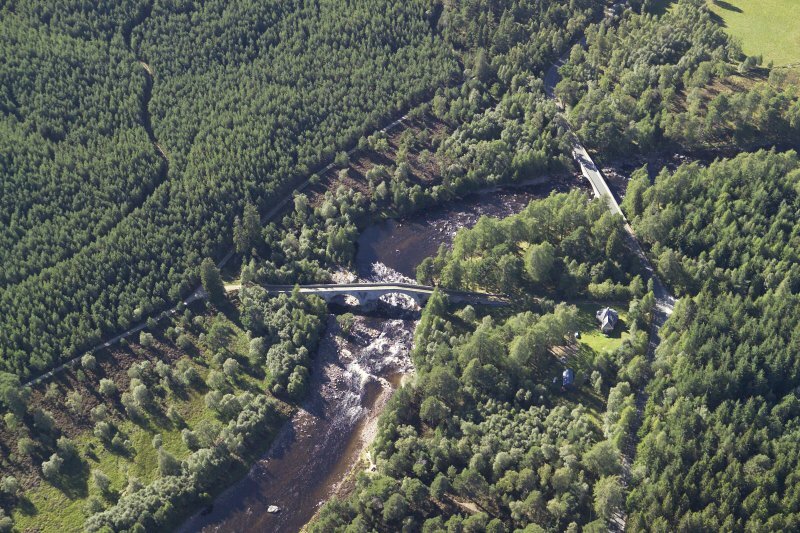 The irregular span dimensions were dictated by the need to obtain suitable pier foundations. The triangular cutwaters have sloping flagged tops.